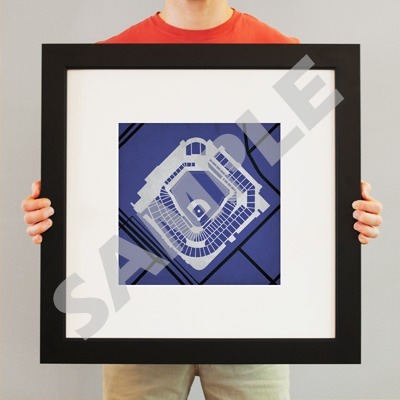 City print of Bryant Denny Stadium, home of the Alabama Crimson Tide. 16.5" x 16.5" Frame: Frames are black with a 2” wide genuine-wood molding. We chose to mount the prints without an acrylic overlay, which shows off the unique properties of our paper stock when it hits the light. The back of the frame is sealed with a dust cover for added protection. Industrial silver hanging hardware is bolted to the back of the frame – ready to hang on your wall. 23" x 23" Mat & Frame (shown): 23" x 23" Frame 11.75" x 11.75" measurement inside the mat. Custom framed in black 1.75" wide, genuine-wood frame. Print is enhanced with a soft white acid-free mat and protected by a premium crystal-clear acrylic overlay. The back of the frame is sealed with a dust cover for added protection. Industrial silver hanging hardware is bolted to the back of the frame - ready to hang on your wall.